Major W.A. Stanton House - Exterior work complete! Click to see! Tours Now Available - Just Jeri offers tours to fit your interests. … that the Goldfield High School colors were Orange & Black? … that the school paper was called the Joshua Palm? Learn more about our walking tour booklet by clicking on the image below. 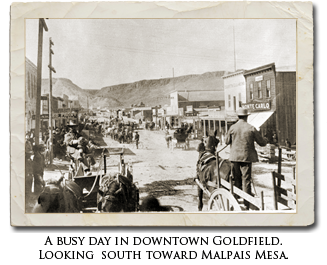 The Goldfield Historical Society is dedicated to the preservation and promotion of the history and heritage of Goldfield, Nevada for present and future generations. 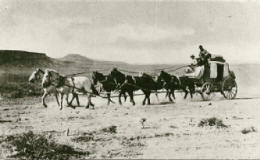 (Photo at right) An early stage coach coming into Goldfield from Tonopah. The Malpais and nearby mountains can be seen in the top left of the photo. Goldfield, Nevada was born in a hurry. Due to the discovery of Gold in 1902, and grew from two miners to over 20,000 people in just six years. Goldfield lost a significant portion of its population by 1910, not because the gold was gone, but because the cost of mining was too great. As the years have gone by, the fabric of Goldfield's history continues to be wrent and torn a little more each year. The Goldfield Historical Society is making a concerted effort to try and stop the devastation of time and make our town a "Place to Remember". 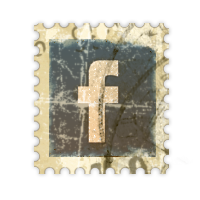 We hope you enjoy this Web Site. 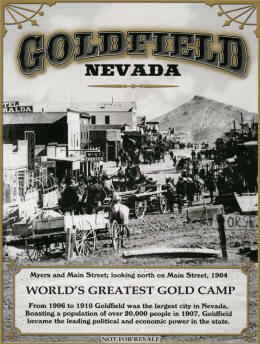 It is our hope that it will show you, through pictures and articles, the excitement that was and is Goldfield, Nevada.